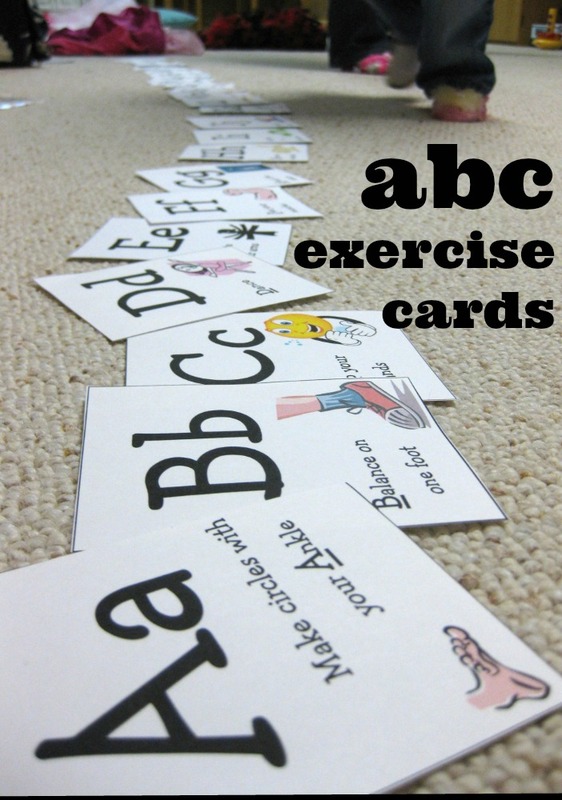 abc exercise cards. . . hooray! Thank you, ABC Exercise Cards, for giving us a fun and burn-some-steam kind of activity this afternoon! After a rainy weekend and another rainy–but exciting!–morning at the College Park Aviation Museum with Owen’s class, I found that by the afternoon, my kids had crazy energy to burn. 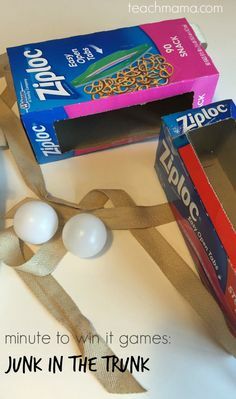 After playing dress-ups and swinging from the downstairs rings, we used this set of ABC Exercise Cards to keep us busy, make us laugh a lot, and get little brains moving–and reading–along the way. 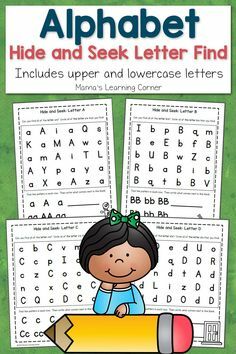 ABC Exercise Cards: These are simple cards each with an uppercase and lowercase letter on them and an action that begins with that letter. 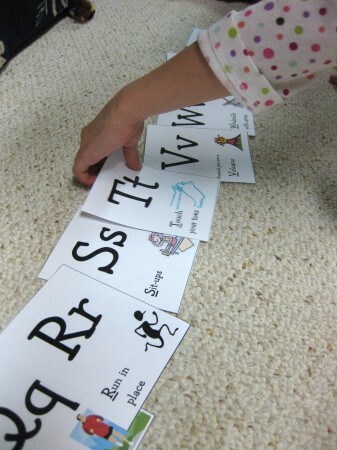 They are similar to our Action, Action 123 Cards, but these cards have the pictures already included and have one action for each letter of the alphabet. And we didn’t use a dice for this game to indicate the number of times to do each action, but you certainly could. 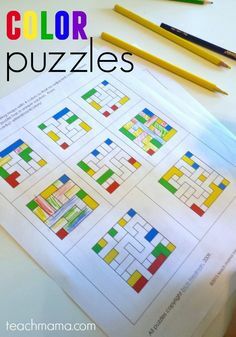 If you’d like to download a set of the ABC Exercise Cards, please visit Homeschool Share, a fantastic site rich with resources for parents and teachers. I found them under ‘My Body Lapbook‘. 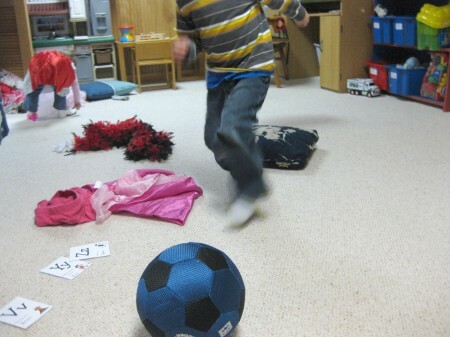 Owen’s rockin it out, running in a zig-zag. Obviously. Owen was in a game-playing mood, so when he suggested we an alphabet board game that we’ve been playing every day (almost for the last two weeks), I said, Hey, I have an idea. I think we have a game that has the letters of the alphabet in it, but it will get us moving and grooving. And I think we all have some energy to burn. Let me get it. I dumped the bag of cards onto the floor and said, Now here I have a card with an action for each letter of the alphabet. When it’s your turn, you’ll pick a card, we’ll read it, and then you’ll do that action. And what do you think we’ll do with the card after we’re finished? Exactly, I said. We’ll put the cards in alphabetical order. And if we need to, we can just sing the ‘ABC Song’ to help us. Okay, the first person to spot a circle in the room goes first. Ready, search! Owen found a circle first, so he led the party, and we went through the entire pile of cards, jumping, hopping on one foot, riding a unicycle (on our backs), waving our arms (like windmills), acting like an inchworm, running in place, and touching our toes–all from A to Z.
Maddy, in her princess shoes, is hopping on one pretty little foot. When we finished the first time, Maddy and Owen immediately asked to play a second time (Cora was too busy dressing up and playing kitchen). I said, Let’s play tomorrow. Why don’t you go through the pile and read and follow the cards you want? Soon it’ll be dinnertime. And so they did, and soon it was, and as soon as I slapped my husband five, I grabbed my bags and headed out the door to tutor. A busy, happy Monday it was. Not only did these cards get us moving, but they also reinforced the all-important letters of the alphabet. Putting the letters in alphabetical order after we completed each card gave Maddy and Owen more practice in understanding where the letters of the alphabet fit in relation to each other, and pictures next to the action instructions made reading easier. 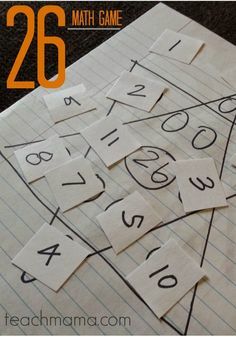 giving the kids 3-5 cards and then allowing them to pick an action, demonstrate that action, and then we could guess what letter they had. 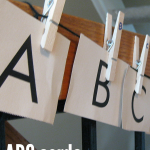 Who knew ABC Exercise Cards could be so much fun? A long while back, I found the ABC Exercise Cardson someone’s website, and (gulp!) I’m not sure whose site it was or who actually created this great resource. However, you can download the same pdf that I downloaded and saved by clicking here: ABC Exercise Cards. My most sincere apologies go out to the talented creator of these cards, which I did link back to Homeschool Share. I feel strange sharing them without proper linking–which I do feel is extremely important in the world of educational resource sharing–but I am sharing them today because we used them, because I think they’re awesome, and because with rainy spring on its way, I think many others may want to use them, too. Anyone who knows where they originated, please let me know, and I’ll link more properly. 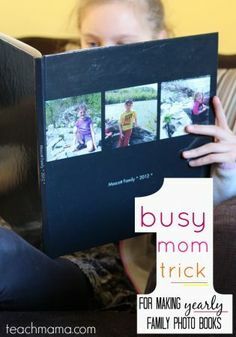 UPDATE, 9/10/11: I did hear back from the sweet Ami, of Homeschool Share, and she asked that I direct readers to The Homeschool Share site, My Body Lapbook, to download this resource. Thank you, Ami, for sharing your incredible work at HSS!! Happy ABC Exercising and sneaking in a little bit of learning! Thanks for sharing. These will be a hit in my house. This looks awesome! I am really excited to print these out today and start using them. 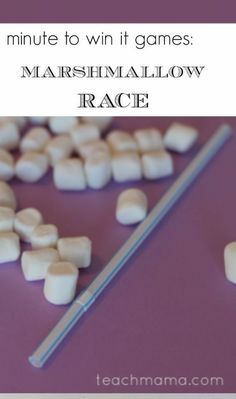 What a great way to do multiple things with the kids! Thanks for sharing this Amy! Love these. 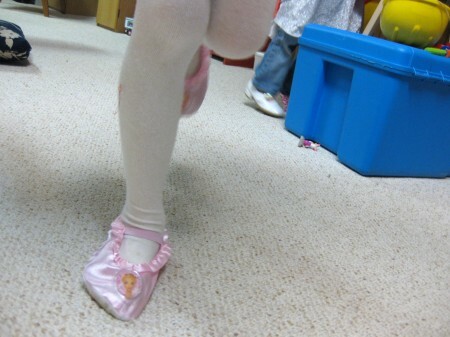 I am going to share a link in we teach bodies to move group on we teach! Fabulous resource. This was a BIG hit with our family! Thanks for sharing all your ideas. I printed these too from whoever made them but mine had a weird square randomly in the middle of the cards. 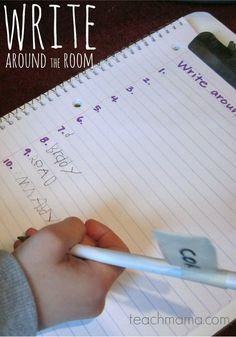 It made it hard for the kids to focus on the letter since they are just learning to identify each letter. I will try your link and see if it works for me, thanks for posting these! These cards are great , children should get a kick out of them! I found some adult exercise cards online that are really helpful too. 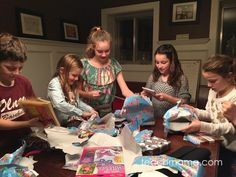 Boa Extreme Fitness Cards …..but they are a little to much for my daughter. Sara! Thanks so much. . . how are the adult ones different from the kid ones?